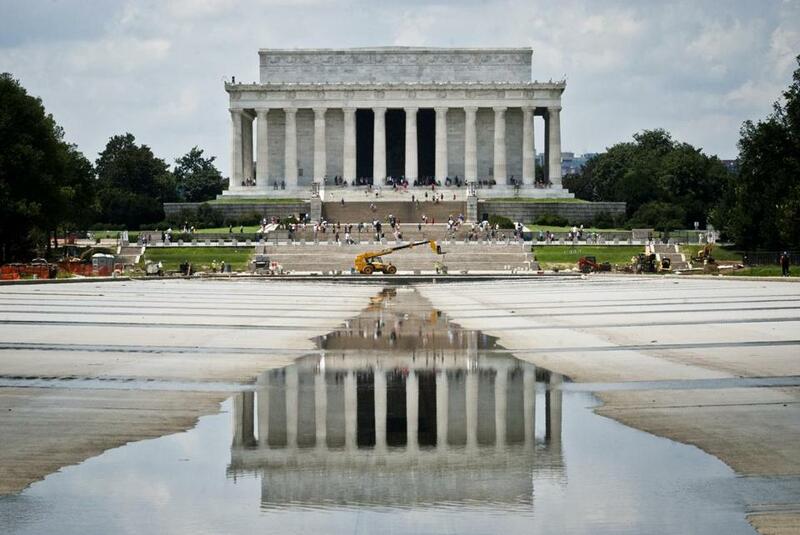 The National Park Service hopes to reopen the Lincoln Memorial Reflecting Pool to the public by the end of this month. WASHINGTON — Inside a plain brown building in Washington on the National Mall, someone within the next few weeks will step to a panel labeled ‘‘Master Control Station’’ and switch on the new machinery. A half-mile away, two powerful underground pumps on the Tidal Basin will start pushing 4 million gallons of water through a buried pipeline at 800 gallons a minute. And from 58 outlets in the concrete floor of the Lincoln Memorial Reflecting Pool, gentle streams of water will begin to refill the pool for the first time in 20 months. The moment will mark the culmination of a $34 million reconstruction project that has had the famous pool at the foot of the Lincoln Memorial closed since 2010. It will debut an almost completely rebuilt and slightly redesigned pool — shallower, but more aesthetically pleasing, with a tinted bottom, sidewalks to replace the old dirt paths and subtle nighttime illumination. It will also employ a new water supply system in which its water will for the first time be drawn from the Tidal Basin — not from city water reserves — and be cleaned and recirculated. The old pool could not circulate its often-stagnant water. And it will return to public use one of the nation’s most storied locales, in a city where other high-profile sites, such as the Washington Monument, remain closed for repairs. ‘‘When people think of Washington, D.C., they think of the Lincoln Memorial, they think of the reflecting pool,’’ Interior Secretary Ken Salazar said in a recent tour of the site. Officials said they have been pumping some water into the pool and draining it to test its systems. If all goes well, they told Salazar, they could begin the five-day process of filling it for good very soon. ‘‘That’s quite the milestone,’’ he said. The National Park Service said it hopes to reopen the pool to the public by the end of the month. The pool, about 160 feet wide and 2,100 feet long, dates from shortly after 1922, when the Lincoln Memorial was dedicated before a crowd that included Abraham Lincoln’s son, Robert, who was then 78. Modeled after the grand canals at Versailles and Fontainebleau, it has for almost a century mirrored the chapters of American and Washington history: civil rights marches, peace demonstrations, presidential inaugural fests, and the Fourth of July fireworks shows. Once the site of winter ice skating and summer toy boat regattas, by 2010 the pool was a fetid wreck, its water off limits to the public. Its old bottom was cracked and leaking 500,000 gallons of city water a week, 30 million gallons a year. And the water, even when replenished, quickly became fouled with dirt, duck droppings and trash. The pool had to be cleaned two or three times a year, with 10 to 15 truckloads of debris removed each time, according to the Park Service. In addition, the pool had nothing to support it as it sat on the soft ground. Only the granite ‘‘coping stones’’ around its perimeter were supported by timber pilings that were driven down to bedrock 40 to 60 feet below the surface. Unsupported, the pool soon began to sink — about a foot in the past 90 years — and leak, according to Quinn. In the 1980s, a concrete bottom was poured over the old one. But the sinking and leakage continued. In 1986, an engineering report said the pool’s structural system was failing. In 2010, the concerns, coupled with government stimulus money through the American Recovery and Reinvestment Act, made replacement of the pool possible, Quinn said. First, the old structure was torn out, except for remnants of the old tile and asphalt bottom. Then, 2,133 timber pilings were pounded through the flimsy old bottom down to bedrock every 2 feet, 9 inches, to support the new pool. High-tech water-circulating machinery was installed. That included the new pump building, which houses a second set of circulating pumps, a filtration system that uses two huge sand vats, and an ozone-disinfecting apparatus. And then, 7½ acres of specially tinted concrete were poured to form the new pool, which requires 2 million gallons less than the old one. The old pool was about 3½ feet deep; the new one is less than 3 feet deep. ‘‘You won’t notice the difference,’’ Quinn said.